Managing Partner, AVER LEX Attorneys at law. Attorney-at-law, Candidate of Legal Sciences, Member of the Disciplinary Chamber of the Kiev City Qualification and Disciplinary Bar Commission of Ukraine, Head of the Procedural Law Committee of the Ukrainian Bar Association (UBA), Member of the UBA Board. Her key practice areas are litigation and corporate law. Partner, AVER LEX Attorneys at law. 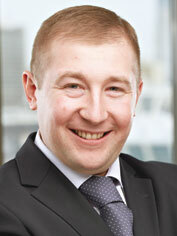 Attorney-at-law, Member of the Kiev Council of Attorneys, Deputy Head of the UBA Criminal Law Committee. Vitaliy Serdyuk is one of few highly qualified experts of criminal cases in the sphere of commercial and corporate activity, in the field of protection of the subjects of entrepreneurial activity and anti-raider protection of business. The documents of international organizations that analyze the legislation of Ukraine and its application consider the system of administrative liability as “parallel” to the criminal system, “differing by the gravity of committed offences, which is difficult to discern in practice” (Investigation and prosecution of corruption offences: Materials for the training course, OECD 2012). The existence of this alternative form of liability (particularly, in the context of the fight against corruption) is regarded as an opportunity to evade more severe punishments because “criminal prosecution requires strict compliance with the process of proving and provides more complicated procedures”. Without denying the above theory we, however, must admit that this similarity can also be used by the “prosecution” side, which happens more often in practice. In some instances the blurred border line between administrative and criminal offences of corruption allows the pre-trial investigation authorities to consider administrative liability as an auxiliary option, when collected evidence is insufficient for an indictment, and in others — to use criminal proceedings essentially as a form of collecting evidence to compile a protocol on administrative violation. An administrative proceeding actually begins when an authorized official draws up a protocol on an administrative offence, which is made with the assumption that the court would consider the case on its merits within three months after the date a corruption offence is revealed and, accordingly, within one year after the date the offence was committed (part 3, Article 38 of the Code of Ukraine on Administrative Offences of 7 December 1984, No.8073-X, hereinafter — CUAO). At the same time, (even though CUAO does not contain a direct reference thereto) a protocol on an administrative offence is drawn up exclusively if there are sufficient grounds to believe that a person’s actions constitute an offence (similar to the practices of the European Court of Human Rights regarding the reasonableness of suspicion — “subject to existence of facts or information that could convince an objective observer that a particular person could commit” an administrative offence), which in practice raises a number of issues. Based on the protocol’s content (part 1, Article 256 CUAO), it looks similar to an indictment in criminal cases, as it reflects a version of the authorized official about circumstances of the committed action, which, according to the latter’s opinion, constitutes the administrative offence, and it also refers to evidence that confirms such an opinion, including names, addresses of witnesses and aggrieved persons, a scope of damage, etc. In other words, all the above information should be collected before the protocol is put together and, accordingly, the administrative proceeding should be initiated before that. By contrast, in the criminal proceedings, drafting the indictment completes the pre-trial investigation stage, at which the investigator has broad authority to collect the necessary evidence, to interrogate witnesses, aggrieved persons, conduct searches at the place of residence and work of a person, etc. However, the pre-trial investigation can be completed not only by drafting an indictment, but also by closing the criminal proceeding and by making a protocol on an administrative offence if it is established that the object of examination is not a crime but an administrative offence. In such an instance, the protocol will contain all collected materials that are sent to the court for consideration of the case on its merits, which simplifies the task of proving the person’s guilt and, accordingly, makes it a more difficult task for the defence. Also, according to the Code of Criminal Procedure of Ukraine of 13 April 2012, No.4652-VI (hereinafter — CCP of Ukraine), in order to start a criminal proceeding it is sufficient to receive a statement on a crime or to independently reveal circumstances that may indicate a crime (Article 214, CCP of Ukraine), without the need to establish the information that indicates elements of an offence, as required for a protocol under CUAO. Besides, criminal proceedings extend a very limited period when a person can be made liable under an administrative case. Generally, a person can be made liable only within three months after an offence is revealed. However, if administrative proceedings follow criminal proceedings, such a term is one month from the date when the criminal proceeding is dismissed (part 4, Article 38, CUAO). Judicial practice shows that in administrative cases, the preceding criminal proceedings may be included to the Unified Register of pre-trial investigations not only on grounds of “corrupt” criminal offences (Article 368 — Article 3692 of the Criminal Code of Ukraine), but sometimes also on grounds of crimes against property (Article 190 — Article 191 of the Criminal Code of Ukraine). Despite the overall negative nature of the above practices, in some circumstances it can be used by practicing attorneys in order to comprehensively and effectively protect the rights and interests of their clients. When a protocol on administrative offence is made, the person has an opportunity to familiarize himself/herself with the position of the authorized bodies and collected materials only when the case gets to court. Taking into account that the legislature sets a fifteen-day term for consideration on the merits starting from the date the case is received by the court (part 1, Article 277, CUAO), the ability to ensure proper implementation of all rights guaranteed to prove the person’s innocence is significantly limited. Of course, the person is not deprived of the right to collect and present evidence in the court of appeal when contesting the court decision of first instance. However, in this instance, acceptance and consideration of evidence will depend entirely on whether the court of appeal finds that there was a valid reason for the untimely presentation of the evidence (part 7, Article 294, CUAO). And the legislation does not provide for any further appeal against the judgment of the court of appeal (part 10, Article 294, CUAO). In view of the shorter term for consideration of administrative cases, in most cases courts of first instance would consider the case on the basis of the evidence already submitted by the sides, since the discovery of documents, bringing witnesses, and (or) appointment of examinations usually require additional time, and suspension of the term for consideration of the case for collection of additional evidence is not provided for in the legislation. Such suspension of the term in administrative cases on corruption is only possible in instances when a person deliberately avoids appearing in court or there is a valid excuse of the failure to appear in court (part 4, Article 277, CUAO). The above implies that the defence should independently bring evidence in support of invalidity of the protocol on administrative offence. The defence counsel in an administrative case can be an attorney, other expert in law, who by law has the right to provide legal assistance (part 1, Article 271, CUAO). Given the lack of a specific law at present that would determine the legal status of an expert in the field of law, the rights and lawful interests of individuals should be defended by a person who has a valid certificate of a practicing attorney. In the interest of the client, an attorney is entitled to request the necessary information and documents, to obtain written explanations from individuals, written opinions by professionals and experts on issues that require special knowledge, etc. (part 1, Article 20 and Article 24 of the On Attorneys and Attorney’s Activities Act of Ukraine). At the same time, the term to respond to the attorney’s request is five work days, and the opinion of a specialist obtained by the attorney can be accepted by the court only equally with other written evidence, since such opinions are not regarded as a separate type of evidence in administrative cases (Article 251 of CUAO), and the defence is not authorized to conduct examinations to obtain opinions on matters relevant to cases. As regards collecting evidence in criminal proceedings, the defence has a wider range of powers to collect evidence in support of its own positions, including by initiating investigative actions subject to its own participation (part 6, Artic- le 223 of the CCP of Ukraine), examination (part 1, Article 242 of the CCP of Ukraine), temporary access to exhibits and documents (part 1, Article 159 of the CCP of Ukraine). The evidence obtained in the above described manner will also be sent to the court or be kept by the attorney ready to be presented to the court after a protocol on an administrative offence is compiled. Thus, the main responsibility rests with the attorney, who should proactively consider actions at the pre-trial investigation stage and evaluate how the evidence collected by the defense can be potentially used in the future to prove the innocence of a person in a case of an administrative offence of corruption that is considered in the manner established by provisions of CUAO if as previously mentioned the pre-trial investigation is completed by drawing up a protocol on an administrative offence. The CUAO of Ukraine was amended by the Act of Ukraine On Changes to Certain Legislative Acts of Ukraine regarding Liability for Corruption Offences of 7 April 2011, No 3207-VI adding some provisions that provide a description of administrative offences of “corruption”. For some persons, it created a situation where their compliance with the qualification requirements (according to the type of their activity) may be a reason for compiling a protocol on a corruption offence. This issue is particularly relevant for civil aviation inspectors of the State Aviation Service of Ukraine. On the one hand, meeting requirements of the International Civil Aviation Organization, such officers are sent by the State Aviation Service to specialized business entities for training on aircraft and simulators and are allowed to flights only subject to conclusion of written employment contracts with airlines. On the other hand, as these inspectors are subject to liability for corruption offences, they are not permitted to engage in other paid operations (section 1, part 1, Article 7 of the On Prevention and Combating Corruption Act of Ukraine of 7 April 2011, No.3206-VI). Thus, the legitimate salary paid by airlines to the inspectors for completion of the mandatory training, according to the controlling authorities can be grounds to file administrative charges against such inspectors under Article 1742 of CUAO. Cases of this category are not rare, and the failure to properly protect rights and the legitimate interests of persons whose actions have no elements of corruption offences may lead to unjustified administrative charges followed by relevant penalties. Thus, despite the contradictory practices of bringing people to administrative or criminal liability for corruption offences and confusion on the part of competent authorities and officials due to the similarities of administrative and criminal offences, the success in such cases largely depends on the attorney’s ability to develop the proper defence. Therefore, the full and comprehensive assessment of the situation and the correct setting of further areas of work would help develop an efficient strategy and create the conditions for the use of any circumstances for the sake of the most positive outcome in favor of the client.